Can your dev team add ALT text to the Wishbox Image? I have a quick feature request that I'm hoping can get into your pipeline really quick. We love your product and I'm happily subscribing to the pro service. I just have one issue—my client (an international, Fortune 500) uses Lotus notes to receive all of their e-mails. Lotus Notes has a well known bug where PNGs are removed from the e-mail. It would be really great if the PNG that is included in the e-mail that is sent our from Wishbox had some form of ALT text that would be visible when PNG display is turned off. I figured you could just return the URL to the link a second time for the ALT text and that would be an effective result for plain text e-mail people as well. We can add a feature request ticket to the system, but we will not be able to provide any ETA. As far as I know, Developers are focused on new projects so it is not likely that additional option can be added very fast. I have noticed that we send a wishbox image URL if notification is set to plain text mode. 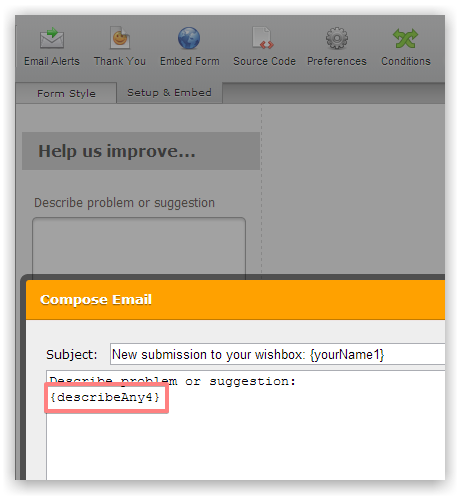 It is added via 'Describe problem or suggestion' field. Result email with the link. Is this something that can work for you? Thank You! This will help.